A few weeks ago I went to a Holiday event sponsored by Nintendo. Aside from being held in the single most spectacular party space I’ve ever been in, (632 on Hudson) the event was terrific because it really did feel like a big party. There was food and drink, decorations, and people spread throughout the townhouse/party space, each room featuring a different Nintendo Wii or DS game. Of course I asked the question fully aware that the TV star wasn’t there just for the fun of it — or even just to meet fabulous bloggers like me. He was being paid. But still – his answer surprised me. Well. That didn’t sound like “I’m being paid so I’ll say whatever they want me to” speak. Well, maybe a little. But still, it made sense. SO, having been sent a copy of Wii Party for review (that’s the full disclosure part), and having told the PR people who sent it to me that I would have a Wii party and write about, and having put it off forEVER, I finally decided to have the party, play the game, and see what happened. By the time the Pizza arrived (and no, PR people, I did not use the Pizza gift card you got me. This is NY. We don’t do Dominos) the kids who didn’t know each other were friends. So it turns out David Tuterra was right – it is an ice breaker. And contrary to my fears about video games, Wii Party isn’t a stagnant staring at the screen, solitary experience. It’s active and loud, and funny, and very, very social. 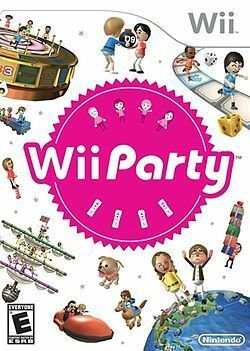 And there are about a gazillion (OK – 13 ) different games in Wii Party and more than a bazillion (OK, 80) mini-games. So there’s a lot of variety. Most important, all of the games are appropriate for any age. No shoot ’em ups or gore here. My kids love the mini games Hide and Peek, where one player literally hides a Mii somewhere on the screen while the other players walk out of the room, then return to look for themselves within a certain time. Wii Party Bingo uses Mii’s instead of letters and numbers, and there are matching games, stop the baby from crying games, puzzles and more. Most of the games are intended for at least two – and often four players, though there is some individual game play as well. And in all of the games you play as your Mii…your digital self. My personal favorite is a game where the remotes are assigned animal noises, then are hidden in the room, and you’ve got to find them before the clock runs out. There’s something decidedly un-tech about it. It feels like an old fashioned party game. And there’s a reason those old fashioned games have lasted: they’re fun. Bottom line: Wii Party is a fun, family game. It isn’t going to rock your world, but it is going to make your holiday party a whole lot of fun. Wii Party is rated E for everyone by the ESRB.